As my contribution to the RPG Gamer Network’s Small Press Week, here’s my review of Open Game Table: The Anthology of Roleplaying Game Blogs, Volume 1. As a lifetime player and gamemaster of tabletop roleplaying games (RPGs), I’m constantly amazed at the amount of passion, knowledge, and depth of other members of this collective of people who play RPGs. There are players that might as well be actors with as deeply as they get immersed in their characters. There are gamemasters (GMs) who know not only the art of story construction, but how to keep campaigns alive for years by constantly changing things up. And then there are people like me. I straddle between the two camps, or at least try to, gleaning what I can from experts on both sides of the divide. I try my hand at writing roleplaying games, playing myself, and hopefully soon starting to GM again. 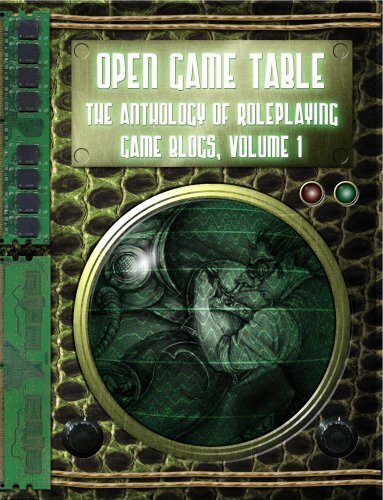 So when I come across new resources such as Open Game Table: The Anthology of Roleplaying Game Blogs, Volume 1, I am blown away by the creativity and imagination bound up within. There are countless roleplaying blogs now, and Open Game Table aims to collect some of the finest blog articles from 2008. The articles may have been dusted off, edited, and illustrated to make them shinier, but they are the same thoughts that appeared on the internet first. Jonathan Jacobs runs a blog known as The Core Mechanic and participates in a network of roleplaying bloggers known as the RPG Bloggers Network. And it’s many of the writers from that network that grace the pages of this first volume of what I hope will be many. Jacobs and the other editors have arranged the book into broad chapters – Play Style, Game Play, Characters & Players, Monsters & NPCs, and so on. Each chapter collects a number of articles on the broad themes for that chapter. I have to say that with the sheer number of authors, pages, articles, and words, there were bound to be a few typos here and there, but they were all extremely minor and never caused any issues. “Giving the Players a Reason to Enjoy the Campaign” by Brandon Daggerhart from Turtles all the Way Down – actually ASK the players about their characters and get them involved in the campaign earlier in a more interactive way. “Extreme Makeover: Tavern Edition” by Stephen Dewey from Musings of the Chatty DM – so you’ve got a ratty old tavern in your campaign… maybe it needs some atmosphere, better descriptions of the food, or a gimmick? This is just a sampling of the many, many great, thought-provoking articles throughout this collection. What’s exciting about this is that it’s just volume 1! The potential is here to produce volumes of this sort of content as long as people are playing roleplaying games and blogging about them. I have to commend Jacobs and the many authors and editors for putting together such a quality product. Open Game Table: The Anthology of Roleplaying Game Blogs, Volume 1 should be on the “want list” of all gamers, whether you’re a player, a GM, or a writer. Order your copy from Lulu today as a hardcopy or PDF or check out RPGNow.com! (Jacobs also let me know that the book was picked up by Studio2Publishing, and is now in retail distribution so you should be able to pick up a copy from your friendly local gaming shop! It’s well worth the purchase, if only for RPG reading on the go, rather than in front of the computer.